Everyone needs a vacation. Start saving now to make it happen. To start saving for a goal, first figure out how much you need to save. Look for ways to reduce spending in order to save more. Keep your savings slightly hard to access so that you can’t easily spend from that account. January brings cold and dreary weather to many parts of the country. What better time to start saving for a getaway to somewhere more inspiring? The sneaky thing about vacations is that once you decide you really need to get away from it all, you may not have saved enough to pay for it. So get started now so you aren’t stuck in the cold weather, wishing you were on a beach. In order to save $2,000 to fund an excursion 6 months from now, you would need to save about $332 per month for 6 months. If you get paid every other week, that’s about $166 per paycheck you’ll need to put away for your vacation goal, assuming an annual percentage yield on your savings of 0.2% and making deposits at the end of each month. You should (of course) already be saving for retirement and emergencies. Aim to spend no more than 50% of your take-home pay on essentials. That includes housing costs, groceries, health care, transportation, and debt payments. Save at least 15% of your pretax income for retirement—that includes any match you may get from your employer. Save 5% of take-home pay for emergencies. Aim to accumulate at least enough to cover 3 to 6 months’ worth of expenses. Then keep saving 5% of take-home pay for unexpected expenses. After you’ve met your essential expenses and saved for retirement and emergencies, you can put some of the leftover money into your vacation fund. Need to cut spending now? Housing is the biggest expense for most people, but it’s one spending area that is difficult to cut once you’ve signed a lease or bought a house. In order to increase the amount you can save in the short term, you may need to reduce spending in other areas. Shop for cheaper car insurance. Look for deals at the grocery store and create meal plans from what’s on sale. Cut your utility bill—keep your home a little cooler in the winter or a little warmer in the summer. Consider switching to LED or CFL bulbs. For long-term energy savings, shop for energy-efficient appliances when replacing items like a refrigerator, dishwasher, washer and dryer, television, or computer. When replacing your car, consider your needs and budget. Consider buying a used car to take advantage of the steep price drops that usually occur in the first year or two of a car’s life. Keep money earmarked for your vacation or other short-term goals separate from your daily spending money and your emergency fund. Setting your savings apart from your emergency fund could help reinforce the idea that you need distinct buckets for distinct goals: Your short-term savings are for one purpose and your emergency fund is for another. Putting your vacation fund slightly out of reach may help you avoid spending your savings prematurely. Nothing is too far out of reach in these days of easy electronic transfers, but putting your vacation funds in its own savings account with no debit card access forces you to go through a couple of steps to get to it. Being on firm financial footing makes nearly everything easier—not only saving for a vacation, but also saving for any other goal, including retirement. 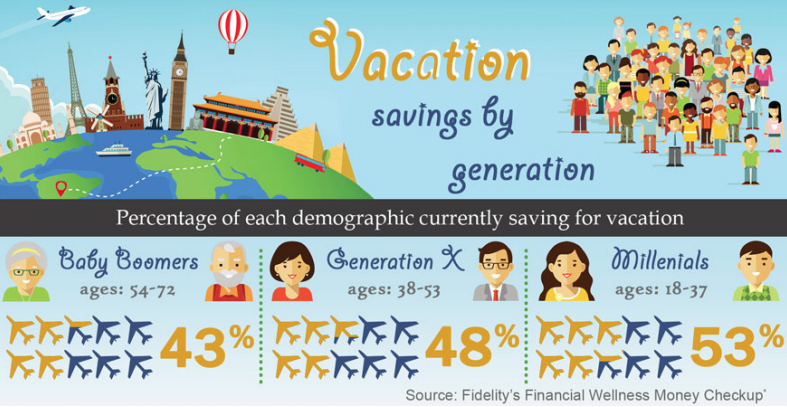 Fidelity’s Financial Wellness Money Checkup found that on average, half of all Americans say they are saving for a vacation. Three in 5 people who feel confident and secure about their finances said their vacation savings were on track. Survey respondents who said they felt financially stressed were as likely to be saving for a vacation as their confident counterparts, but only 1 in 20 from this group said their vacation savings were on track. It can be fun and gratifying to save for an adventure. Plus, saving for short-term goals like an upcoming vacation helps you practice for the longer-term goals. If you can save up for a vacation, it could give the confidence and commitment to save a little more for retirement. And that may make a big difference to your future.